As we close the book on the year that was 2017, it is a time to reflect on accomplishments of past efforts and set our expectations for the year to come. Looking back always presents some challenges, we know what occurred and can easily determine what we should have done. It is always easy to know the direction that should have been taken after we know where we ended up. The outcomes of decisions or actions in life are never truly known until the circumstances play out, such is the case with government as well. 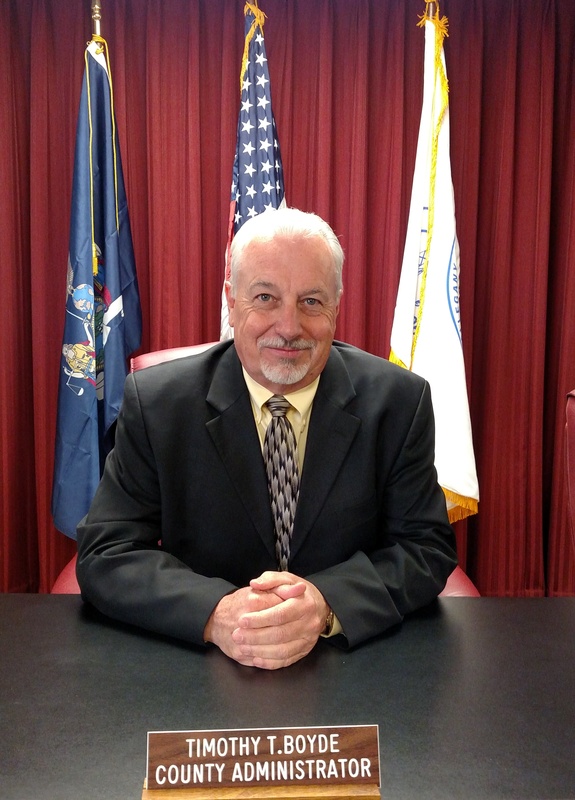 The Allegany County Board of Legislators had a very good year. They faced some difficult decisions and had several positive outcomes. The tendency in an election year is to effect some positive change and not to rock the boat but that was not the case for the 2014-2017 Board of Legislators. Their achievements were many and very positive. 2018 Budget – The 2018 budget approved by the Board of Legislators reflects at 6.68% DECREASE from the approved 2017 spending plan. The levy was reduced by 3.11% and the rate per thousand dropped a total of $1.07 to $14.98. These rates are at their lowest rates since 2005-2006. Arguments can and have been raised that more could be done. There is always more that can be done however this is a major achievement. We have not seen any budget reductions of this magnitude in any of the 61 other counties throughout New York. Building Renovations –Allegany County initiated some much needed renovations of the old jail area. Many of the current human services departments are working in cramped quarters and the construction will provide room for the employees to do the county’s work. The third floor will be occupied by the Public Defender’s Office and the administrative portions of the Health Department. The ground floor will be retrofitted to allow for the Department of Social Services to better serve the public for intake, supervised visitations, and related services. Clinic services offered by the Health Department will remain in their current location. The $2+ million dollar renovation will be paid with existing fund balance monies negating the need to borrow additional funds. By doing so, there is no new debt incurred and this is a long term savings for our constituents. Project completion is projected to be mid-late spring of 2018. Park and Ride/Crossroads – Construction began in August and was completed in late October for a new Park and Ride option at the Crossroads. The nearly $900,000 dollar project was funded primarily through state and federal funds and had been in the planning phase for a number of years. The project expands parking options for the facility, affords a well-lighted area for commuters on the county transportation system, and provides some positive news for the interchange area. The county’s cost for this project was approximately $80,000, mostly non-cash match. The Crossroads area also received positive news with the announcement of plans to develop a fueling station, hotel, restaurant, conference area. The interchange will see a nationally branded hotel option, branded restaurant, conference room space and a branded fueling station. Construction is to begin in August 2018. Records Storage/Management – The County has earmarked nearly $250,000 to address ongoing records storage and management needs. Various departments are required by statute to preserve and maintain numerous records. The required retention timelines vary from annual to perpetual and have expanded significantly over the past several years. Frankly, the retention requirements had expanded beyond the capacity of the county’s storage facilities. A new system will be installed in early January that nearly doubles our capacity in the facility located adjacent to the old county landfill and significantly enhances storage capabilities within the Belmont facilities. It is anticipated that enough capacity will be available for the next 5-8 years. Funds for this project were also accessed from general fund dollars and will not require additional borrowing. The option of building or acquiring additional needed space would have been substantially more than the proposed alternative. Heroin/Opioid Crisis –The Ad-Hoc Heroin/Opioid task force was an active and powerful force in 2017. They commissioned several studies and held powerful community activities in efforts to raise community awareness. This group is composed of treatment professionals, individuals in recovery, faith based, non-profit organizations, and county departments committed to affecting positive outcomes for the community. Community showings of the Hungry Heart and production of Voices of Allegany County provided a powerful statement on both the breadth and depth of the crisis but also reasons for optimism. 2018 will present a number of challenges to the incoming Board of Legislators. By choice or through the election process, the county will experience a 40% turnover in its collective representation. The learning curve is steep and the challenges are many. Despite changes in the board composition, the focus never changes. Efforts are focused on being good financial stewards of tax payer dollars, affecting positive change for the betterment of our constituency, and adapting to the changing landscapes created at the state/federal levels. Indigent Defense and Raise the Age – These are two examples of changes being pushed down to the county level that could result in an increased strain for the county budget. Funding has been secured to offset some costs in the Indigent Defense arena but it will have an impact on how certain cases are initially handled at the local level. The impacts could be felt by the local town/village judges, local and state police, and the District Attorney’s office. While the program is slowly being implemented, we need to be cognizant of the potential impacts once fully implemented. Raise the Age could have a substantial impact on our court system, social services office, probation department and related entities. Costs associated with Raise the Age requirements could be significant for a rural county such as ours. Fortunately, a strong collaborative effort is in place within the county preparing to respond to a number of the yet unknown demands/expectations this initiative will require. Economic Development – It will be important to continue building on the economic development efforts at the Crossroads. Through the efforts of the IDA, opportunities are gradually developing. It requires time and effort to nurture development strategies and opportunities to any area. Sufficient groundwork has been laid with several site selectors and Allegany County is beginning to appear on the radar screen for future activity. Much like sports, not all swings yields a grand slam, not every pass goes for a 99 yard touchdowns, it is a process. Sometimes it is a long, arduous, and painful process but one that must be endured, supported, and embraced. Patience is key but so is preparedness. The county should develop potential options including incentives, project ready sites, and ways to fast track the permitting process to increase opportunities for success. Future Growth – The County currently operates several campuses resulting in a service disconnect. It is true that some services can and should be located in areas for ease of access and improved response time. This approach often adds to increased costs, stretched span of control, and confusion in conformity to established operational protocols. A centrally located campus (to the extent possible) enhances opportunities efficient/effective county government operations. Despite the renovations to the existing Belmont structure(s), our current space will be maxed out in several years. As new initiatives are foisted on county government, growth will be inevitable. The aforementioned Indigent Defense and Raise the Age initiatives are but two real examples of expansion not of our making. It will be important to develop a long term strategy for our future space needs. CWSSI – The County will need to complete the County Wide Shared Services Initiative in September of 2018. Our experience indicates that outside assistance may/will be necessary to complete this mandate. A RFP has been issued for this service. Quoted rates are higher than anticipated and a decision will need to be made shortly on our next steps. It appears this initiative will become an ongoing mandate based on the Governors latest pronouncements. Conceptually good, implementation presents a number of challenges for us. Long term it will be in the best interest of the County and other local governments to find better ways to share services, provide more efficient methods of operations and to provide better quality services through this process. Summary – This is by no means a comprehensive list for either category. It is difficult to compress the positive actions and activities into this brief space. Certainly the efforts to maintain our county roads and bridges deserve a mention as well as the accomplishments of our various human services agencies. Without our dedicated and committed employees, none of this would have been possible. It is time to pause and reflect on the accomplishments but dwell on them. There is more work to be done. As we look into the near future, challenges and opportunities abound. Maintaining good financial stewardship, preparation for the 2020 Census, responding to new (and often unfunded) state/federal initiatives, and economic development opportunities will require our attention moving forward. And of course, there will always be the next unknown/unanticipated challenge or opportunity emerging on the horizon. The ability to adapt and respond to each of these challenges and opportunities will dictate our future success.